Once again, we are blessed and happy. The guest on this week’s show about YEARNING is Catholic author and speaker Elizabeth Ficocelli. She was a guest on an earlier show on INSPIRATION — and she is truly that. 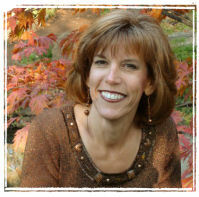 Elizabeth is a best-selling, award-winning author of maybe fifteen books for adults and children. Her adult books include Lourdes: Font of Faith, Hope & Charity; The Fruits of Medjugorje: Stories of True and Lasting Conversion (Paulist Press); and Shower of Heavenly Roses: Stories of the Intercession of St. Therese of Lisieux (The Crossroad Publishing Company). For children, Elizabeth has authored a middle-grade chapter book entitled, The Imitation of Christ for Children. She has also written a series of books for younger children on the sacraments including: Child’s Guide to First Holy Communion, Child’s Guide to Reconciliation, Child’s Guide to the Seven Sacraments, and Child’s Guide to the Rosary (All from Paulist Press). For teenagers and young adults, Elizabeth has authored Bleeding Hands, Weeping Stone: True Stories of Divine Wonders, Miracles and Messages (St. Benedict Press/TAN Books). She is also the author of Kid Tea (Marshall Cavendish), a secular children’s book that teaches preschoolers colors and days of the week. Elizabeth is currently working on a new book project for Ignatius Press. Our reason for having Elizabeth on this show on YEARNING is to discuss her latest books: Where Do Priests Come From?, Where Do Sisters Come From? and Where Do Deacons Come From? They are wonderful (and acclaimed) books which are well written and illustrated. They are sure to appeal to young minds who are intrigued by the priest, deacon or nun they see working at the local parish, at a food bank, at a hospital or teaching religious education. THESE WILL MAKE GREAT GIFTS for your children, your grandchildren, the director of religious education in your parish — various places and circumstances such as this. In addition to her books, Elizabeth has authored numerous magazine articles for leading Catholic publications such as America, St. Anthony Messenger, Columbia Magazine, Catholic Parent, and Liguorian. She has appeared on the following EWTN television programs: Bookmark with Doug Keck, The Journey Home with Marcus Grodi, The Abundant Life with Johnnette Benkovic, and Sunday Night Live with Father Benedict Groeschel. She has also been a guest on numerous Catholic radio programs, including The Catholic Channel with Gus Lloyd, Catholic Spirit Radio with Kris McGregor, Kresta in the Afternoon with Al Kresta, Catholic Connection with Teresa Tomeo, and Morning Air with Sean Herriot. Elizabeth has also been a presenter at national Catholic conventions such as the L.A. Congress and the National Catholic Educators Association Conference; state conferences such as the Oklahoma City Catholic Women’s Conference and the Indiana Catholic Women’s Conference; and has been a guest speaker at numerous schools, parishes, and various Catholic organizational meetings. Quite some time ago, we had a guest interview with a young woman – a wonderful young woman from the Direction For Our Times organization. I’ve since signed up for their monthly messages — messages shared by Ann The Apostle of DFOT. I believe this December message ‘from Jesus’ through Ann is aimed at those of us yearning to break the bonds of sin and yearning to respond to God’s will in our lives. I’ve borrowed this and hope to share this on our podcast as well. Dear apostles, it is with hope that I come to you today, speaking these words to your heart. I am hoping that the plans I have for your life will come to fruition. Do I require that you be powerful? Important? Do I need you to be people of great wealth or great influence in the eyes of the world? Will My plan be threatened by your imperfection or your difficulty maintaining holiness in every moment? Do I need only angels? Or do I need apostles of good will serving exactly where I have placed them? You were created to persevere and even flourish with limited understanding of all that is happening around you and through you. Yes, dear apostles, I am filled with hope. I am hoping that you accept My love. I am hoping that you allow Me to bring you healing, daily. I am hoping that through you I can love and heal others whom you will encounter in your daily experience. I bring you so many gifts of knowing Me, both directly and indirectly. Sometimes, I bring these gifts directly into your soul. Sometimes I send these gifts to you through the soul of another. I am saying that sometimes you will be the recipient of My gifts and sometimes you will be the one delivering My gifts. We are so united, you and I. We are together now and when you are finished on earth you will understand how closely I worked with you. You will be so happy when you understand the extent to which I blessed others through you. Dear friends, I come at Christmas as an infant in a manger and you rejoice. Truly, understand, that each time you cooperate with Me in your day, you are bringing Me into the world. When you see how others were blessed through your fidelity, you will understand the fullness of rejoicing. Yes, today, your Infant King comes to you with heavenly hope. Beloved apostles, I instruct you to bring this hope to others, regardless of the circumstances around you. This entry was posted in Blog and tagged Direction For Our Times, Elizabeth Ficocelli, Yearning. Bookmark the permalink.